This project came about because of a challenge on Smaller and SmallerAdventures, a yahoo group. 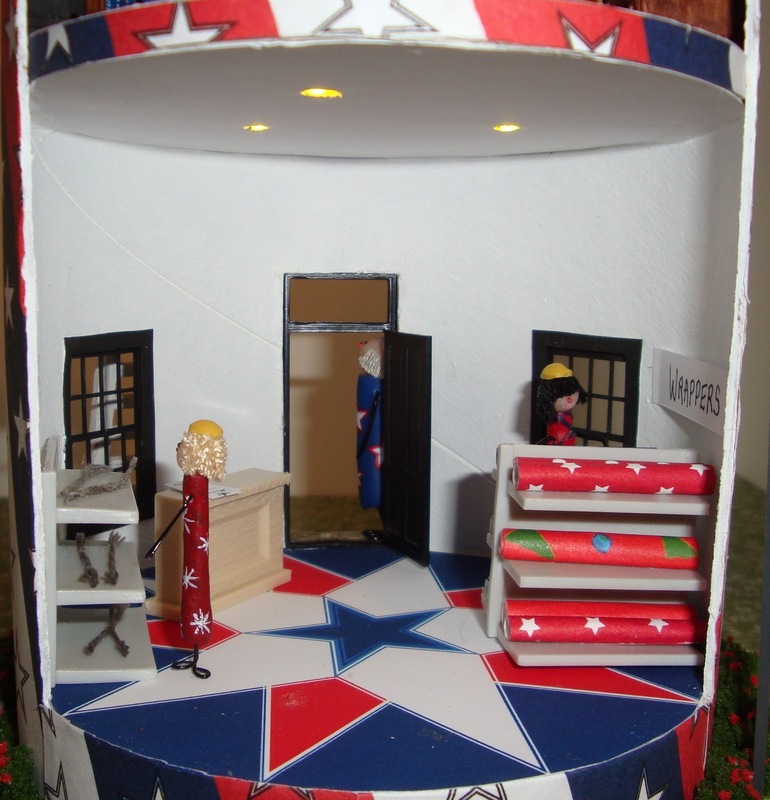 It was to use a round box - like a salt box or oatmeal box to create a red, white and blue themed project. The challenge was to do the project and complete it by July 31st. Although, that deadline was extended to Aug. 31st. In addition to the challenge, we had the opportunity to participate in a swap for it as well. We could do either or both. I decided that with finishing school in June that I would have the time to do both. To make my project I used an oatmeal box. I have made a project like this in a saltbox already so this was no big deal. Actually it should be easier because I would not be doing the plaster cloth as I did in my Scaredy Cats. I have these great intentions to plan out everything and go step by step in an organized way, but often my creative muse gets ahead of me and I skip a step. This project was no different. I knew I wanted to light it and I decided I would light it up using a LED kit from Evan's Designs. I had purchased them months ago to have on hand. Well as I worked the idea around, I decided I would have the push button on the bottom. I had obtained a dome from a thrift store recently that didn't have a base. I knew I could make a base from foam core. Thought it would be easier to have the button on the bottom so didn't have to lift the dome to turn on the lights. But I discovered after doing this that since I was using foam core, it wasn't sturdy enough to handle this scenario so I had to redo the base. The first base was foam core bottom, then a builder foam middle. But then I got this idea to add more lights on the top as I figured I have the height in this tall but skinny dome, why not use it. So the new base was all foam core. The first layer of the base is big enough for the dome to sit on but just enough, no bigger. Then next is a layer that the dome fits around. Next was a base for the box. My box being for oatmeal was open already one end and I decided to invert the box. This allowed me to insert a base into the box at the floor. I initially cut my opening for having a builder foam floor, but turns out that three layers of foam core board equals the layer of builder foam. Using three layers, I have one layer glued in place as the floor at the same level the builder;s foam would be. This left room to hide/house the battery and its holder. I cut another foam core circle for insetting below the floor and cut out a space for the battery housing. This piece was glued in place to the two layer base. Sections were cut out also for the push button and wires going to and from the button. I added to the battery layer pieces to contain the wiring but also keep the building from moving around. The opening for the project was cut of the side and I also pulled out my windows and doors. I have purchased some at shows to have on hand for those projects not designed yet. Comes in handy for things like this. I decided where I wanted the door and windows. I decided to leave the middle above the door for the label I would create. I then measured to allow reasonable space for these openings both to each other top to bottom and also side to side. Then I cut the openings. I also test fit each component. I also cut a foam core circle for the second floor. The LED's were added to this circle. These point down to the first floor. They were easy to hide in the foam core, but I added a paper layer to hide the wires. Holes were cut to allow the light to shine down. To do the second floor lights they are glued to the ceiling paper (a heavier paper). For both the first and second floor, I created and printed floor papers. The one for the first floor was my design done in Word using drawing objects and different colors and the second floor was using a print found on the Internet. On the top of the box was the inset - not totally flat or squared top. I had decided that I would use it as a rooftop patio. I was also leaning towards something that reminded me of the used up firecracker so decided to go with a black ground cover here. I added black railroad blast to the rooftop. I also had determined that my project needed to have a lighting sculpture on the rooftop that resembled a shooting firework. After some fiddling and considering my available options, I decided to use some tinsel as the hollow portion and sequins as enhancers to the LED's. The LED wires are actually what hold them up. Sturdy wires. This shows the tinsel. It comes like this but can be stretched. I got this package of multiple colors at a mini yard sale, but I believe it was sold as tinsel for 1" christmas decoration. I have used in 1/4" tree decoration. The wires for the inside lights come out to the same side. I added a groove in the box for the wires and then used tissue paper to hold in place. The wires were short in one section and so had to add a leader wire to get them to connect all underneath. The interior for both levels was painted white. Once that was completed I applied the full outer label. I had created a label using the drawing object function in Word. I use that a lot to layer and repeat things to create stuff. Once I made the row of stars and the different background rows, I grouped them and then copied them to fill up the page. I started applying the label by applying glue to the edge next to the opening in the back. I added glue at the window and door openings and also along the top and bottom but not all over. I wanted the label to float over the wires and didn't want any wrinkling either. 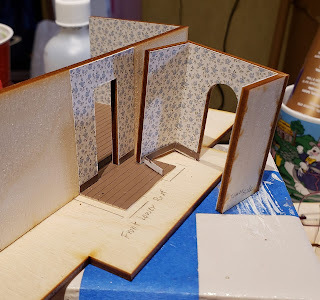 To fill in around the second floor, I used a piece of thick card to edge it so didn't have the foam core showing. I had to piece together the label for each of the opening edges. Don't look too close. I could have printed another page but just used up the scraps. Next I painted the windows. The door was already black and had decided it looked good so that's why I painted the windows black as well. I cut out thin card window frames for the inside and painted them black as well. At this point I realized the issue with making the openings a tight fit for the components. I had painted the openings and that made for too tight an opening. I trimmed and sanded them to allow for the components. Once everything fit, I glued the windows and doors and their inside trim in place. For the base, I added a rock/stone paper I had on hand around the sides. The section where the dome would rest, I faux painted. When the dome is one, can't tell the difference between my painting and the rock paper. 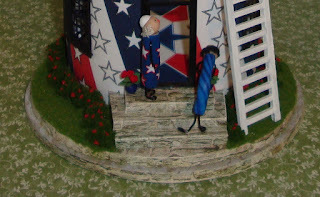 When I was adding grass to the base, some fell on the edge for the dome and that would have looked good as well, but didn't won't to cover my faux painting or deal with dust if the dome edge wasn't covering the grass. The steps to the first floor were made from foam core pieces. I added the rock paper to cover the edges and top. My orginal plan was to have a scaffolding in the front for Sparky to work on the sign, but after a detail discussion with my husband who does construction work, I decided to go with a ladder instead. The ladder on the front was made from a plastic balcony my dad gave me. I used my dremel tool and a cut off wheel disc to remove the platform and then painted the railing white to become the ladder. There is also a ladder to the side to reach the roof top that is a grandtline product, I think. Didn't have enough of it on hand to use for both places. The text label was done in Publisher but I could have done it in Word. I made it so the addition of the word Store wouldn't cover any other text. 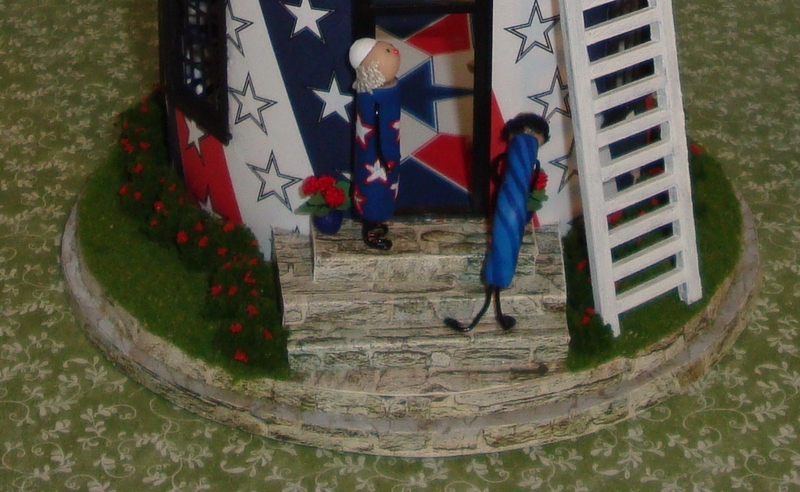 Also since this is a re-purposed firework, the addition of the S on top of the label seemed fitting. The S was cut very careful from wood and then painted. The ' is painted on to the label. To make my Boomers I used scupley. I rolled them and cut to length. I used the end of a paint brush to round the ends. 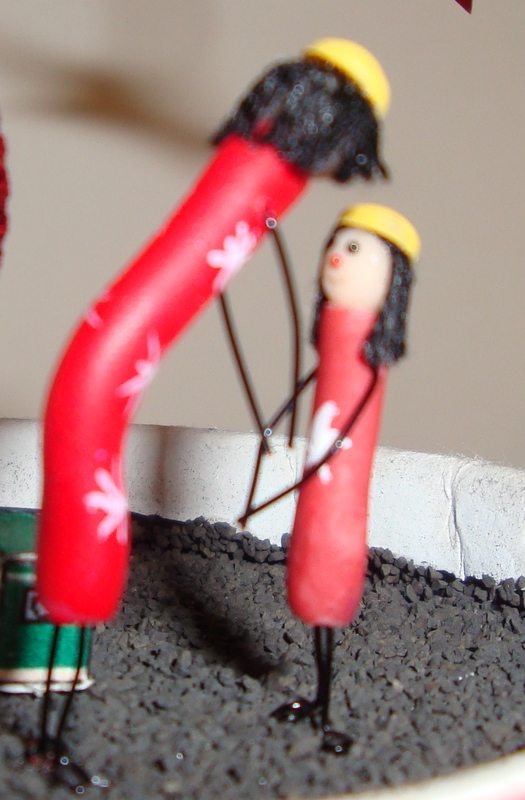 I also inserted the wire to make holes for the legs and arms, but didn't bake them with the wire. The wire I used ended up not being the same size as the black wire so I had to drill out the holes to allow them to be inserted. All the leg wires were pre-bent, but then after I glued them in some had to be re-bent. That caused some breakage, but glued back ok. The arms were bent after inserted into the body. The thicker wire was 20 gauge and the thinner wire was 26 gauge. The thinner being easier to work with. Sparkle and Popper were made using the thinner wire. Heads were made of scuply. I added the bead eyes and nose before firing. Some have mouths and some don't. Hair made of either embroidery floss or unraveled bunka. Their hard hats were goggle eyes. I painted their bodies. The swaps - although I participated in the red/white/blue firecracker theme swap, my swaps have not arrived. I made a round BBQ grill as my swap. I should make one for myself since I don't have one at this point. The swaps I used other than the geraniums from Pam Junk were from previous swap events. I had decided early on that this was going to be a firework store. 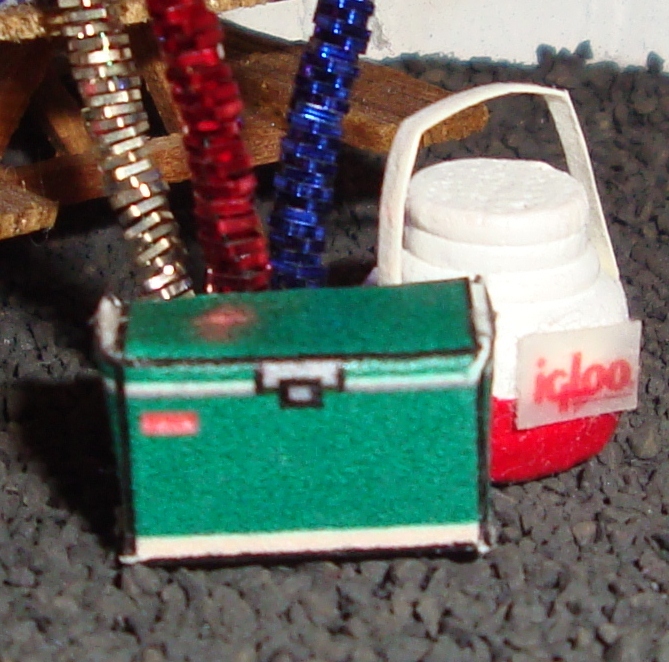 But I didn't relish the idea of making tiny fireworks. I am very pleased that Banger explained they wouldn't be selling fireworks but works for them. So that worked out very well for me to make fuses and wrappers - embroidery thread and scrapbook paper rolled up. The shelves in the store were made from some plastic shelves that my dad gave me. I used my dremel tool to cut them down. They both were two sided and double width. Also the counter was cut down as well. The only thing I ordered specifically for this project was the extra led lights. All of this I had on hand for a some day project. I highly recommend that if you want to create to purchase things when you see them. Does not mean to purchase a lot, just a bit here and there and collect them.